Goldfrapp and a host of collaborators take that white horse for another well-deserved go-round. Stars for several years in the UK and Europe, Goldfrapp's increasing success in North America has been slow but steady in the wake of the duo's three acclaimed albums, 2001's Felt Mountain, 2003's Black Cherry, and last year's Supernature. While past singles like "Train", "Strict Machine", "Ooh La La", and "Number One" all stormed the charts across the Atlantic, it hasn't been that easy when it comes to American audiences. Goldfrapp has smartly taken alternate routes to get its music into the collective subconscious of Stateside listeners, having songs appear in everything from commercials for Nintendo, Diet Coke, and Verizon, to strategic placement in TV shows such as Nip/Tuck and Las Vegas. Still, mainstream chart success has been fleeting, with Supernature peaking at 138 in the US and a slightly more respectable 88 in Canada. But the musical partnership of singer Alison Goldfrapp and producer Will Gregory has connected well with the dance crowd, as Supernature's four singles all placed well on the dance charts, including a pair of top spots. Something dance music enthusiasts and fans of Goldfrapp have long been aware of is just how well the music lends itself to the remix process. Past remix compilations of Utopia and Strict Machine have demonstrated this; in another wise attempt to prolong the positive US momentum (and to give its American fans a chance to -- legally -- obtain some key remixes without paying steep import prices) Goldfrapp has given us its first official remix album. We Are Glitter not only serves as a fitting companion piece to the superb Supernature, but allows some of the best dance producers around (plus a couple of other inventive artists) to flex their remixing muscle. Neatly sequenced, the 76 minute disc shifts gears comfortably between floor-thumping Euro-house and more restrained sounds. The dance-oriented mixes are faithful to the originals, with each producer adding their own highly distinct touch to the arrangements. On "Lovely 2 C U", German powerhouse T. Raumschmiere typically combines hard beats and ferocious, almost industrial-inspired electro distortion, making for a very enticing contrast with Alison Goldfrapp's airy, luxurious vocals. Italian DJ Benny Benassi continues to milk the "Satisfaction" gimmick for all its worth on his extended remix of "Ooh La La" (much like he did on his "Strict Machine" remix two years ago), but for all the repetition of that same old undulating, electro-house synth line (is it possible to hear a Benassi track and not think of Wendy's burgers? ), the remix is still a propulsive one. The trendy pair of Alan Braxe and Fred Falke do a fantastic job with "Number One", adding only the subtlest of alterations, including a thicker, Numan-esque synth and a delicious breakdown that comes to a near-halt, only to quickly gain momentum a minute later. And the great Carl Craig transforms "Fly Me Away", perhaps the most trite track on Supernature, into something richer, infusing it with the dark eroticism that the original sorely needed. More rewarding, however, are the bolder remixes. The always charming Icelandic group Múm takes the sultry "You Never Know" and places it in a more pastoral setting, the breathing synths of the original giving way to cascading piano and electric guitar, while the normally buoyant "Number One" is given an air of innocence that is downright beguiling. The Shortwave Set strips "Satin Chic" of all its T. Rex trappings, adds piano and acoustic guitar, and shifts from a lively 2/4 tempo to a more languid 4/4, and the Flaming Lips offer a space rock interpretation of the same song, adding effects-laden guitars and male backing vocals. It's the always enjoyable DFA, though, who scores the biggest coup with its remix of "Slide In", turning it into a 13 minute funk epic. And while those darn cowbells have been used by James Murphy and company ad infinitum, how can we not like them as the song careens towards a percussive conclusion. 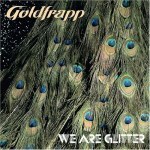 Also included as a bonus track is the terrific We Are Glitter Mix of "Strict Machine" (mixed by Goldfrapp and Gregory themselves), which for some reason was not included in the US release of the single in 2004. But while most US fans undoubtedly already have the MP3, it's good to finally have the song on disc on a domestic release. Hell, it's great to have all 12 tracks here. Sure, in the long run, it's hard to top Gregory's production on the original album versions, but if there's something we've learned over the last five years, it's that when a new Goldfrapp album comes out, the fun never ends there.